A well-known and very famous old southern apple noted for its rapid growth and excellent keeping qualities. Originated in the South in the 1800’s and was quite an important commercial variety praised for its durability and ruggedness during shipping. The fruit is so durable and hardy, Northern-grown apples raised for shipping were often hand-shoveled onto railroad cars without incurring any significant damage! Known to apple growers in the 19th Century as a “mortgage lifter” for its reliability in fruit production and ability to hang firmly on the tree late into the season. Though historically never considered a very high-quality fresh eating apple, Calhoun in Old Southern Apples (2011) believes the apple does not qualify for the widespread condemnation it received in older books and references. He says these early bad reviews resulted from apples grown too far north to ripen properly. A USDA bulletin from 1910 states that Southern-grown Ben Davis apples were “generally more juicy and of notably better quality” than Northern-grown apples. 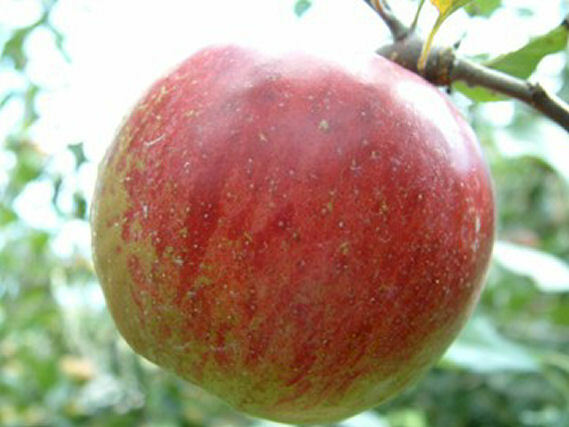 Medium size with waxy, bright yellow skin mottled with dark and bright red blushing. Ripens in October and improves in flavor while in storage.